NekroMarshall (Grade: A+) This graphic novel isn't for everyone and if you are expecting a traditional super hero story, then you should look someplace else. 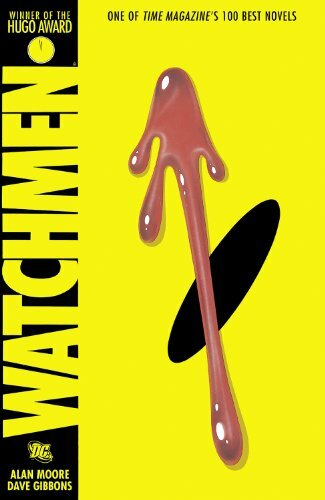 Watchmen takes place in a world where a masked group of vigilantes used to go around and fight crime, but now they have to struggle with aging and relationship issues as well as dealing with irrelevancy all while the world gets closer and closer to doomsday. This is an amazing story, check it out! skeletongue (Grade: A+) I've read this every winter since I bought it the year it was released. It blew my little adolescent mind and continues to entertain to this day. atom warcock (Grade: A–) read grant morrison. seriously though, this is great. yeahitskonnor (Grade: B–) First graphic novel I ever read. Really enjoyed it, but felt it was missing a special spark of some kind. The illustrations were awesome, but I thought the story was a bit overly dramatic. Still very fun especially for my first graphic novel. moultano (Grade: A) I get chills from some of the chapters every single time I reread them. I don't think I've ever read another book so dripping with meaning and context but so addictively readable.